Rosh Hashanah 2018: The prayer places of Jewish, Synagogues will commence the Jewish New Year 5776 celebrations across the globe from today. It is one of the most important occasions for Jewish people as per their yearly calendar. Moreover, it is considered to be the first of the High Holy Days. When is Rosh Hashanah in 2018 (date)? This year, it will be observed from the sunset of Sunday 9th September to September 11. So, as per the lunisolar calendar which Jewish consider their calendar suggests that it will commence the Jewish Year 5779. Like every other religion’s important festival celebration types, it is also celebrated in various ways from sending wishes, messages, quotes, images, wallpapers, to synagogue services to special meals and lots more. Below we have a list of the ways of celebrating this important festival and some crucial things related to it. A shofar is a famous musical instrument of Jewish people which is made up of ram’ horn. It is typically used in Jewish synagogue for entertainment and spiritual purposes during the celebrations of Rosh Hashanah and Yom Kippur, the Day of Atonement – the holiest day as per Jewish religion. Shofar comes across several times in the Hebrew Bible, the Talmud and in rabbinic literature. It is played before, during, and after the Musaf prayer on Rosh Hashanah. There is a tradition of wearing light or white colored clothes during the festivities to symbolize the new hope, beginnings, purity, and renewal. Some men may be seen wearing a special white robe – Kittel – over the regular clothes. Tashlich is formed from the Hebrew word which means “to cast” and used in the sense of disposing of sins. It is an old age customary thing for Ashkenazi and Sephardic communities and observed on the first day of Rosh Hashanah. Its process includes throwing pieces of bread or food into flowing water. 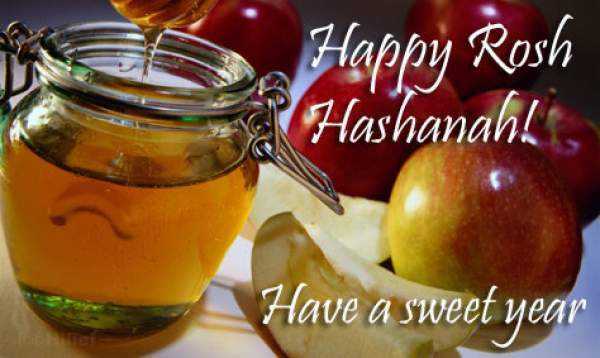 Another popular custom of Rosh Hashanah is to dip apples into honey to welcome the new year as ancient Jews believed that apples bring healing power. It is also mentioned in the holy books that it is the fruit means to send to those who are ill during Talmudic times. Another famous tradition is to light candles to welcome the Jewish holidays with warm hearts and light. As this is a custom to start believing that Jewish New Year has arrived after the sunset, the candles’ light creates a sacred space. The number of candles depends on the free will of the respective families. Some may light up as many as the number of the family members. However, each family lights up at least two candles which is a general practice for the one simple reason – the male and the female aspects of God’s presence. The second belief to light 2 candles is for the two words – zachor (remember), and shamor (keep). After all these things, the Jewish day of rest, Shabbat is observed. In Hebrew, Shanah Tovah (Hebrew: שנה טובה‎) (pronounced [ʃaˈna toˈva]) which means “[have] a good year”. In Yiddish, אַ גוט יאָר “a gut yor” (“a good year”) or אַ גוט געבענטשט יאָר “a gut gebentsht yor” (“a good blessed year”). In Sephardic, Tizku Leshanim Rabbot (“may you merit many years”), to which the answer is Ne’imot VeTovot (“pleasant and good ones”). L’shanah tovah tikatevu v’tichatemu meaning “May you be inscribed and sealed for a good year”. After RoshHashanah ends, the greeting is changed to G’mar chatimah tovah (Hebrew: גמר חתימה טובה‎) meaning “A good final sealing”, until Yom Kippur. After Yom Kippur is over, until Hoshana Rabbah, as Sukkot ends, the greeting is Gmar Tov (Hebrew: גְּמָר טוֹב‎), “a good conclusion”.